With a long history as Mpumalanga’s premier casino and entertainment spot, Emnotweni Casino is a great place to visit. Locals in the province’s capital Mbombela (formerly Nelspruit) have been visiting this casino not just for the gambling experience. Located right next to the Riverside Mall and close to the Kruger National Park, Emnotweni is a prime location. Read on to find out why you should put Emnotweni on your holiday destination list. With an array of games to choose from, Emnotweni Casino has something for everyone. The casino has 425 slot machines which feature reel slots, video poker, and video reel machines. These slot games can be found in the smoking and non-smoking areas of the casino. The machines take values from 2 cents up to R25, making it accessible to any budget level. Players hoping to win big can play their various progressive jackpots which range from 10 cents to R10. Try your luck at the stand-alone progressives or at one of the nine progressive jackpot games on the floor. Furthermore, all their slots are available 24/7 throughout the whole year. Emnotweni Casino has 11 gaming tables available to punters. Players can try their luck and skill at blackjack, Raise ‘em Poker Xtra, and roulette. The table games area opens at 11:00 and stays open until the casino closes. For those high rollers and exclusive gamblers, there’s the never-disappointing Salon Prive. Emnotweni Casino chose the best spot to place the Salon. Surrounded by beautiful views of the Lowveld and Botanical Gardens, guests can play slots and table games with their own bar and private service. There are various casino promotions running at Emnotweni Casino. Visit their website to check what they have on offer. Players get to sign-up for the loyalty programme linked to all Tsogo Sun establishments. Around Emnotweni Casino, there is accommodation suited for all budgets. Let’s take a look at Southern Sun Emnotweni and StayEasy Emnotweni, both operated by Tsogo Sun. 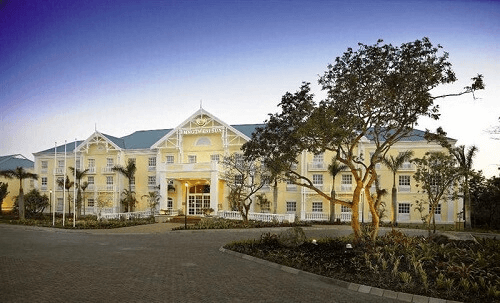 The Southern Sun suits those who want luxury accommodation – the business and well-monied travellers. It offers guests a four-star rated hotel with luxury amenities such as free WiFi, DStv, and a gym among other things. Enjoy some great food at their restaurant, and some cocktails or a light meal at their poolside terrace. The StayEasy Emnotweni is perfect from those on a stop over on their way to Mozambique or looking for cheap yet high-quality accommodation. Its rooms are comfortably decorated with modern amenities such as free WiFi, DStv, and an informal breakfast restaurant. The StayEasy also has a swimming pool and a relaxing patio for unwinding. Emnotweni Casino has its very own cinema complex screening the latest blockbusters. For guests who can’t gamble, or are taking a break from their winning streak, the Movies@Emnotweni will give them a memorable experience. Enjoy discounts when guests use their loyalty cards to book movies. If guests want a break from the Emnotweni hotel’s restaurants and bars, there’s the Riverside Mall. Within walking distance, the Riverside Mall has about 140 stores including dozens of dining options. Furthermore, if guests need some retail therapy, they can enjoy the shopping experience. Emnotweni Casino offers more than just a gambling experience. Its visitors will get to experience the beauty of the Lowveld, friendly staff, and high-quality service. Find out more about top land-based casinos in Mpumalanga with CasinoZA.com.